Newspaper group warns of challenging market and Brexit uncertainty. Daily Mirror owner Reach has taken a £200m writedown on its assets because of a tough ad market and Brexit, leading to a £120m pretax loss. 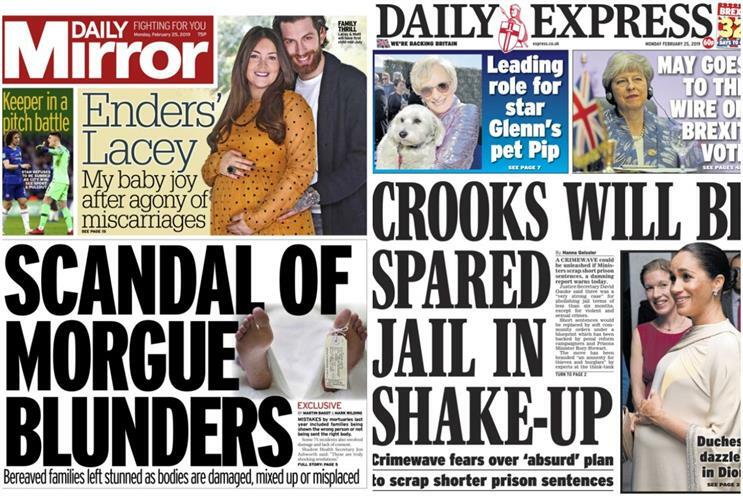 The company, known as Trinity Mirror before it acquired the Daily Express last year and rebranded to Reach, posted a £119.9m loss before tax for 2018, compared with a pretax profit of £81.9m in 2017. In its earnings report for 2018, released today, Reach said the £200m non-cash impairment reflects "the more-challenging-than-expected trading environment for advertising revenue generated locally and the short-term uncertainty arising from the UK’s exit from the European Union". The company’s overall revenue increased by 16.2% to £723.9m, thanks to the acquisition of the Express and Star titles from Richard Desmond’s Northern & Shell last year. However, on a like-for-like basis, Reach’s revenue dropped by 6.6% year on year. Print advertising revenue fell slightly year on year by 0.5% to £176.7m, which Reach said was in line with the rest of the market. Digital ad revenue, meanwhile, was up 23.5% to £103.6m, but Reach complained that this was impacted by "algorithm changes made by Facebook and Google early in 2018, which adversely impacted our audience". Average monthly page views in 2018 grew by 6% year on year to more than a billion, Reach said, while average monthly mobile page views grew by 15%. However, average monthly desktop page views fell by 9%. Circulation, the company’s biggest source of income, was up 27.2% to £362.1m – something that Reach credited with an increase in coverprices. The company has also set aside even more money for "dealing with historical legal issues" of phone-hacking claims, which first came to light almost a decade ago. In 2018, Reach added £12.5m to its provision for settling legal claims, bringing the total amount to £75.5m. Simon Fox, chief executive of Reach, said: "I am pleased with the performance we have delivered in 2018 and encouraged by the stronger finish to the year. We have begun 2019 in a strong financial position with good momentum on the integration of Express and Star, and with clear plans for digital growth."